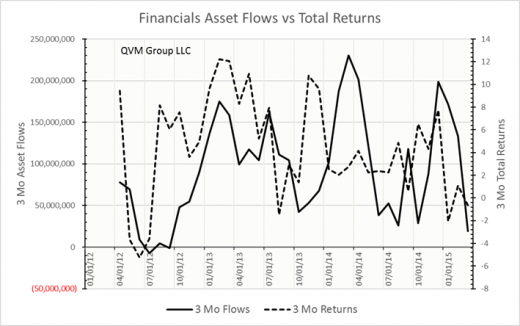 Asset flows can be indicators of developing strength or weakness of a fund, which sometimes confirms price movements and sometimes diverges from prices. 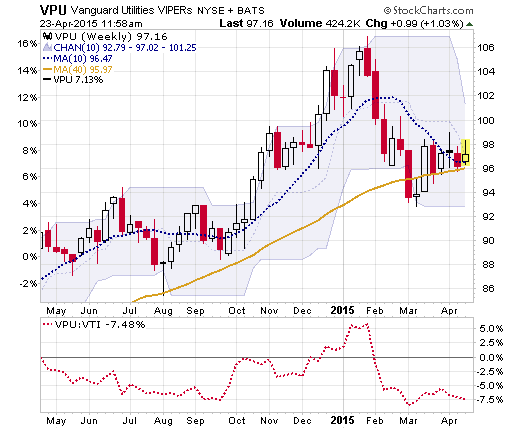 If asset flows diverge from price patterns, there is a suggestion of a trend reversal in the prices. While not diagnostic alone, divergence between price patterns and asset flow, should trigger further investigation of fundamental and technical factors. 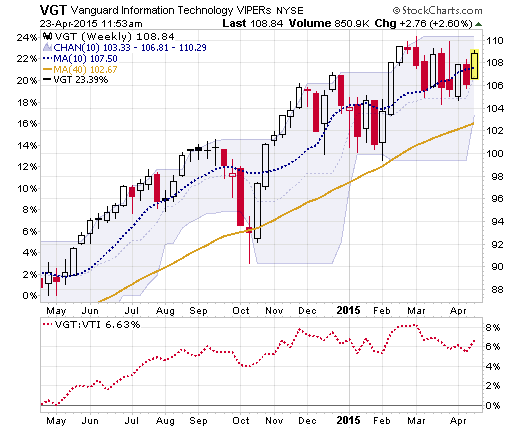 Let’s look at relative asset flows for MSCI US sectors as they have been realized through Vanguard sector ETFs. Those ETFs obviously do not show all sector asset flows, they do show relative flows within the Vanguard sector family. 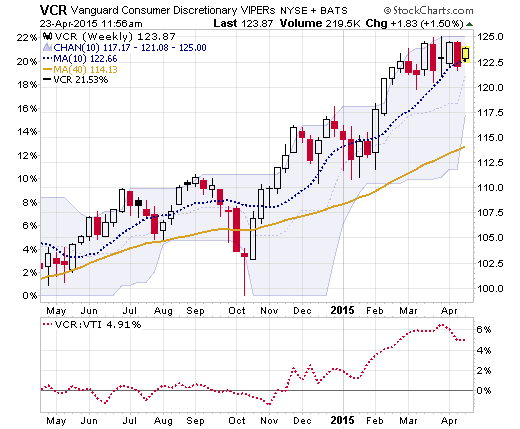 By focusing on relative asset flows, we think the Vanguard ETFs provide a reasonable window. Asset flows are net of asset performance. 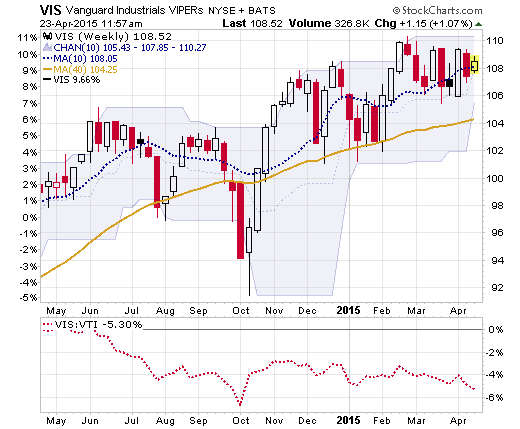 These are the symbols for the Vanguard ETFs based on the 10 MSCI Global Industry Classification Standard “GICS” system. 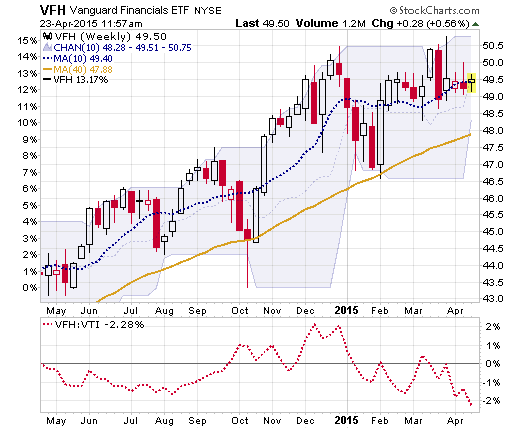 Healthcare showing strong flows is not at all surprising, given the strong price performance for a considerable time. 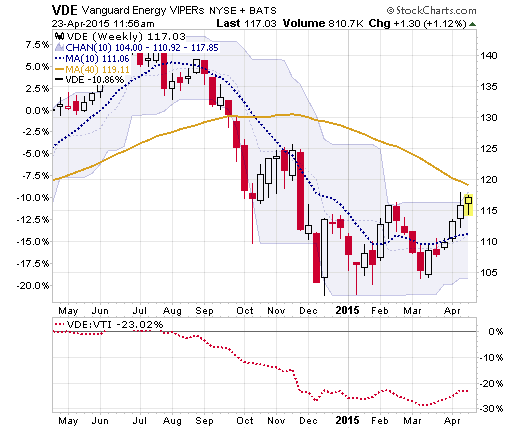 The surprise, if any, is the strong flows into the energy sector. 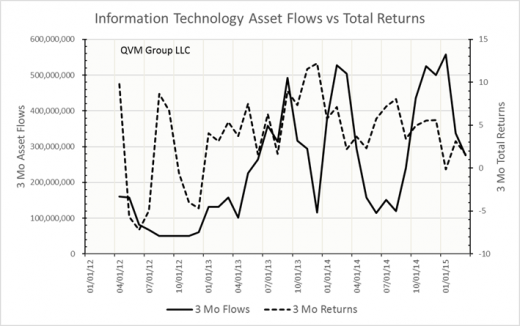 It looks like investors have seen long-term value in energy and have been putting money there. 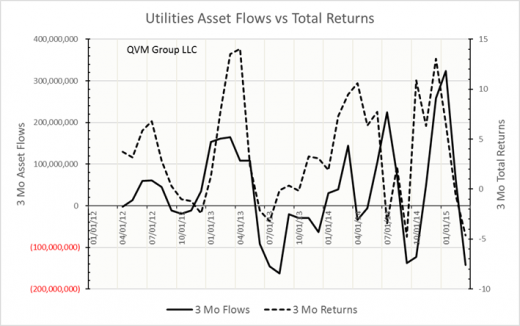 Utilities have shown the weakest flows. 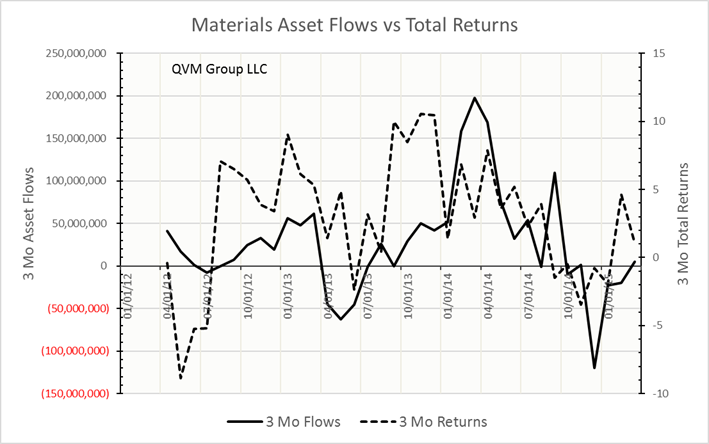 Figure 2 shows the relative asset flows on a monthly basis from 2012. 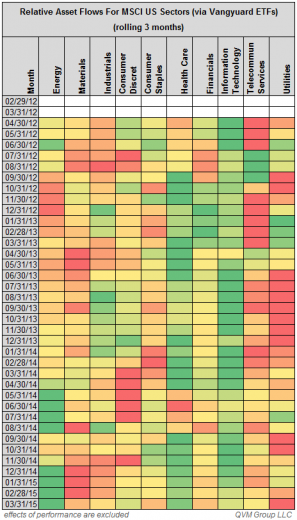 Energy flows were relatively average until mid-2014, when they picked up the pace to strong relative flows. 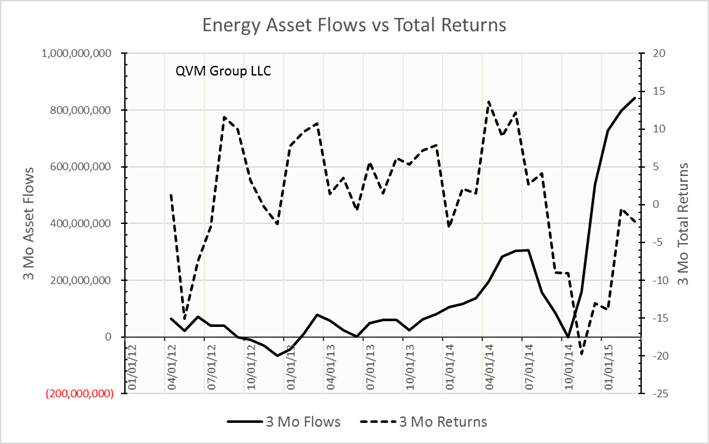 The energy asset flows began improving their relative strength in April 2014, and has a strong relative flow in May 2014. By February 2015, energy accounted for 80% of asset flows within the 10 sectors, and was 43% in March (numeric data not show in Figure 2). Figure 3 plots the rolling 3-month asset flows to the energy sector in dollar terms versus the rolling 3-month total return. 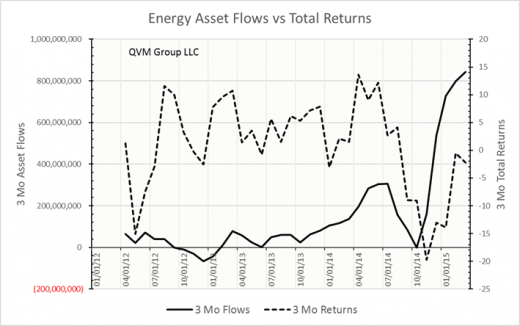 This year, the asset flows into energy are stronger than the total return would led one to expect. 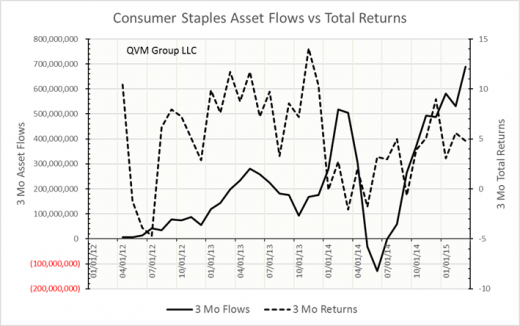 This is not a divergence, but it does suggest we may be in an accumulation stage, where quieter money is moving to the sectors. Figure 4 shows the energy the trend (200-day average) is still down, but the price is rising short-term toward a cross of the trend; but still 23% below the total US stock market (VTI), as shown in the lower panel (energy ETF divided by total US stocks ETF). Given the way crude oil seems to have formed a base in the 40s (Figure 5), the strong relative asset flows in to energy seem to be reasonable. 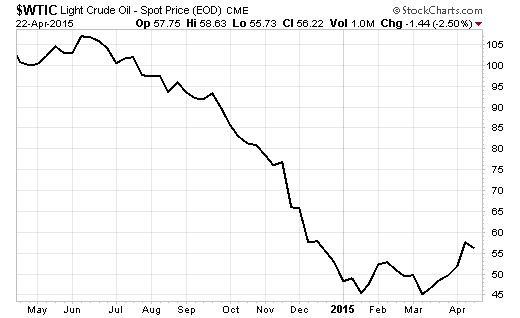 Figure 5 shows what seems to be a forming possibly a double bottom base for oil before moving up into the 50’s. Much to go wrong, but the turn up in energy stock prices, oil prices and strong asset flows, suggests energy is currently an attractive opportunity. 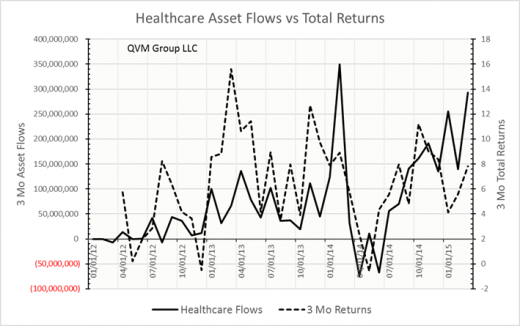 Figure 6 shows the 3-month asset flows and 3-month rolling returns for the healthcare sector. 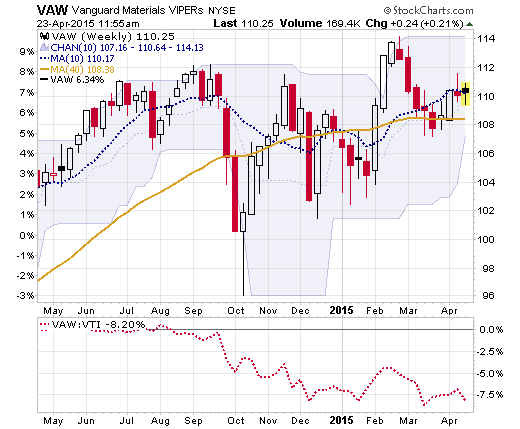 It has been the best performing sector for some time, and the asset flows show a complementary, supportive pattern. 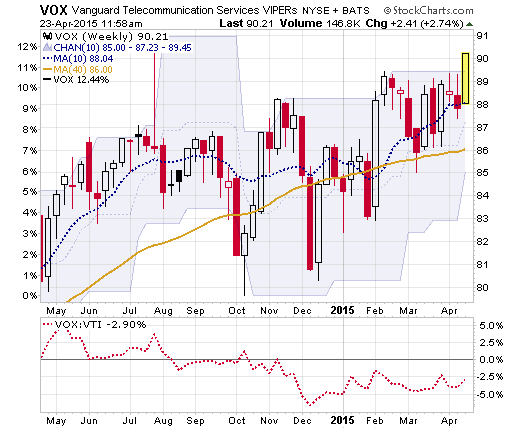 Unless the biotech sector is bubbly and pops or deflates, healthcare is probably still a good place to have assets. 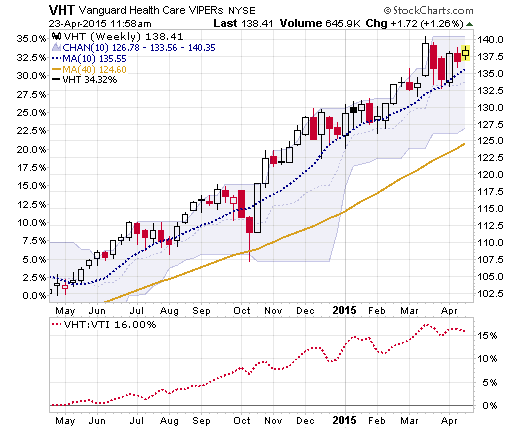 Figure 7 shows the lovely price chart for healthcare. What else can be said about that — it’s lovely. Figure 8 show flows and returns for information technology. 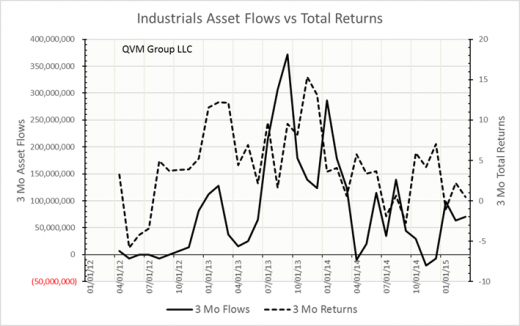 The relative flows are above average, but not as strong as for energy and healthcare (see Figure 1). 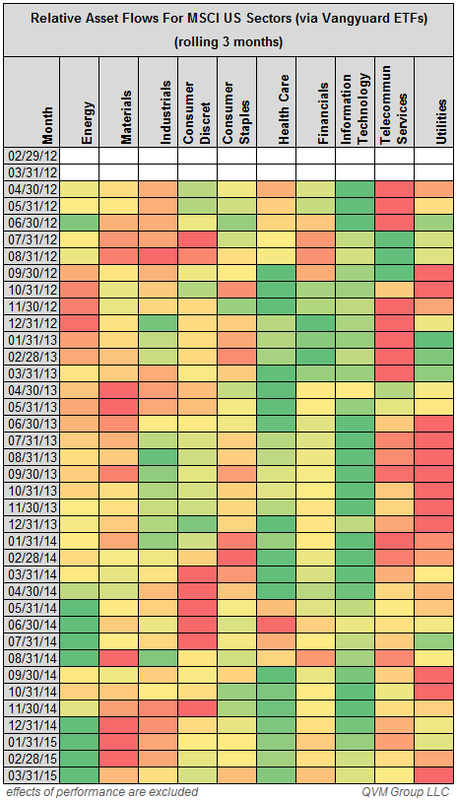 The flows appear more up-down-up-down variable than for energy and healthcare. 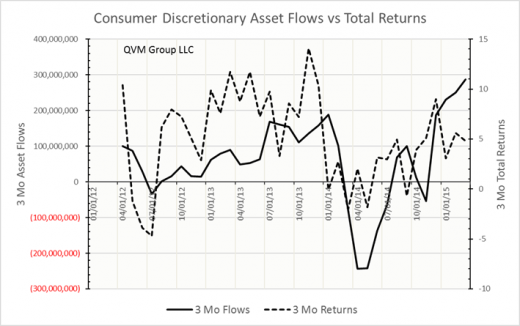 Figure 9 shows price variation that generally corresponds with the rise and fall of the asset flows, but much more dampened that for the flows. 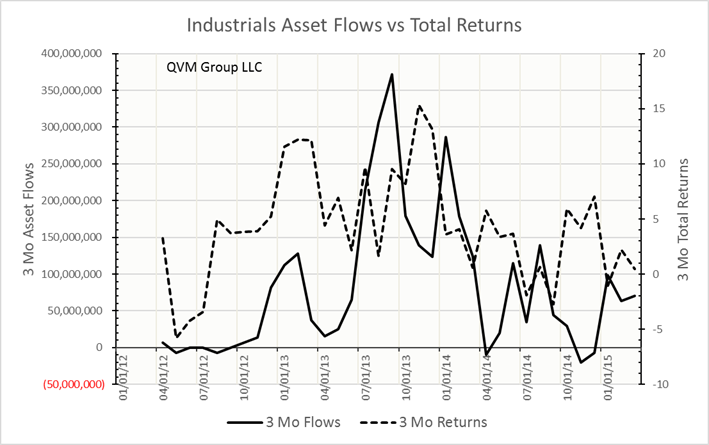 Figure 10 shows flows and returns for utilities. 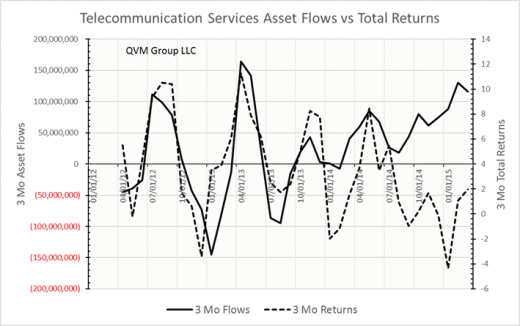 It reveals more negative flows than the other sectors we have looked at so far, which themselves are in synch with the rolling returns. 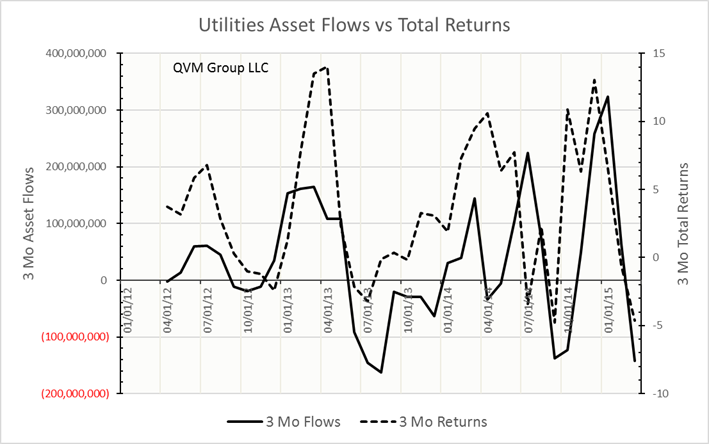 Figure 11 shows a price chart for utilities that is not consistent with the recent negative asset flows. The prices are rather flat, while the flows are negative. Is this a distribution phase? 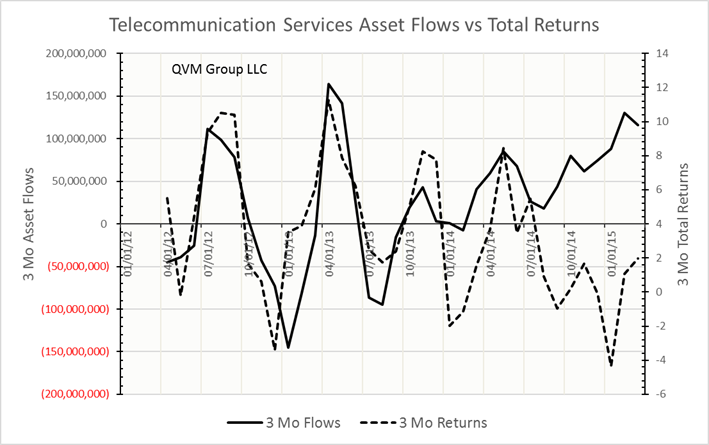 Figures 12 and beyond show asset flows, rolling returns and price patterns for the remaining sectors, which have asset flows which are neither relatively strong or weak, included here for completeness, but not the focus of this article. 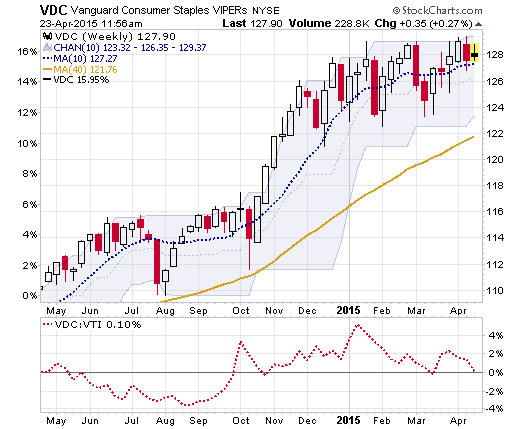 This entry was posted on Thursday, April 23rd, 2015 at 2:40 PM and is filed under Analysis, market outlook. You can follow any responses to this entry through the RSS 2.0 feed. Both comments and pings are currently closed.